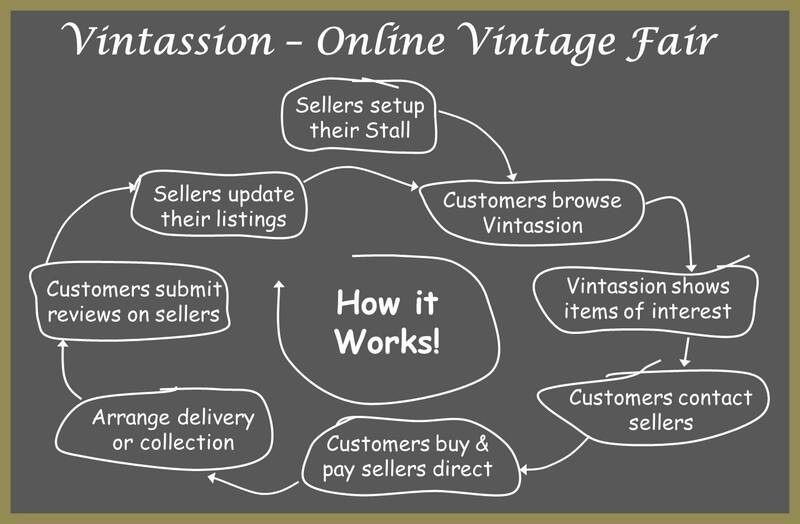 Vintassion Online Vintage Fair provides sellers with a value for money innovative approach to showcase and help sell all types of vintage, retro, upcycled & handcrafted to customers both online and any fairs you trade. THERE ARE NO LISTING FEES AND NO COMMISSION FEES ON SALES, including for any items purchased using the buy now "PayPal Click Here To Buy" button. You are also welcome to dual list items from any other sites you may sell e.g. ASOS, Etsy, eBay, Depop, Facebook and your own, and simply refer customers there with a web-link to Checkout. In addition, if you also enjoy trading at Fairs you may let customers know about any you are planning to make on the Vintage Events Finder by easily linking them to your online Stall web page under the tab My Fairs . So when vintage shoppers like the look of your Online Stall items and would like to see more or take a closer look before buying, they have an opportunity to visit your Stall at an Upcoming Vintage Fair or Event. You can also easily share details of the events you are trading on your social pages (Facebook, Twitter & Pinterest) by clicking the social share buttons on the Vintage Events Finder. To help you get started as a Vintassion Seller you can take advantage of the no tie-in 30 day free trial offer. After the 30 day free trial it's then your choice whether to continue and keep listed up to 100 items on your Online Stall at any one time for another 30 day selling period for only £10 or for a 365 day selling period for only £50. Either way you can still have unlimited reserve stock (inactive listings) i.e. items under your Stall so to speak ready to place on your Stall with the click of a button. Therefore as you sell you can quickly restock sold items to keep listing up to 100 items if you wish for no additional fee during a selling period. So there’s absolutely no limit on the number items you can sell during a selling period just a limit on having no more than 100 items listed at any one time on your Online Stall. Customers may purchase items online direct from Sellers in accordance with their Policies (Terms & Conditions) including, Terms of Sale, Returns Policy and Delivery Policy. Sellers may be based in the UK or overseas and may offer a range of payment options including a buy now "PayPal Click Here To Buy" button, which enables Customers to click and pay the Seller of an item securely via PayPal using their credit or debit card, bank account or direct from their PayPal account if they have one. For further details on how buy now works please click here. If Customers wish to find out more information or wish to purchase more than one item from the seller, they may send the Seller a buy enquiry message, by clicking the "Contact" button on the item listing. Please note none of the items listed on Vintassion are offered under an auction bid type of sale, although you’ll see items marked or best offer indicating Sellers are open to best offers, which Customers may send them by clicking the "Contact" button on the item listing. 1. You list items on your Online Stall by title, description, price, payment options, and delivery/ collection options, and up to 8 photos, plus optional video. Items cannot be listed under an auction bid type of sale, although you can indicate for an item if you are open to best offers. 2. Customers may search the entire fair or your Online Stall by item name and quickly refine their search by selecting a vintage category, material, and era. 3. Vintassion presents items of interest in an easy to compare format. It is dedicated to helping customers who are specifically interested in buying vintage, retro, upcycled and handcrafted i.e. it is not a general items for sale website. Proactive promotion of your listings to Vintage Lovers through its weekly UNCOVERED Newsletter and social media Facebook, Twitter, Pinterest, and Instagram; where we have a growing 10,000+ genuine vintage followers combined! You can also use the social share buttons on your item listings to easily share and promote them on your preferred social pages (Facebook, Pinterest & Twitter) and you can pin item listings to our Group Pinterest Boards, both for items you have listed on Vintassion or elsewhere. ​Simple value for money fixed fee for running your Online Stall (£10 for 30 days or £50 for 365 days) i.e. there are no additional fees charged for listing items or on the value of items sold. 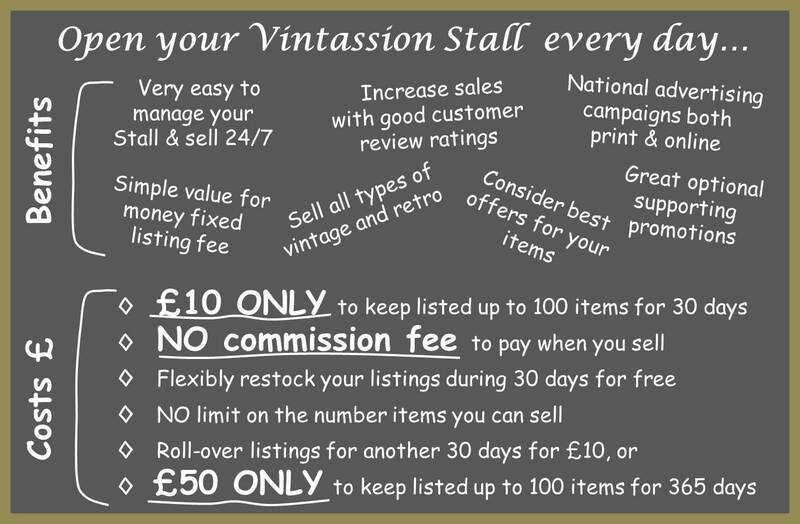 Flexible restocking and changing of items on your Online Stall with the Vintassion easy to use My Stall Setup - Dashboard. Increased sales by getting good Vintassion customer reviews on the items you sell (your overall customer review star rating is the average of your last 50 reviews). When customers can’t find what they are looking for, they can send a Help Me Find It message, which Vintassion will forward on to you so you may contact them directly if you can help. Highlight 5 items - highlight 5 items on your Online Stall to be featured in relevant search results by promoting them above any non-highlighted items, and showcase them on the Vintassion home page rolling preview. You have the flexibility to select/ change/ replace any of your highlighted 5 items at any time e.g. when you sell a highlighted item. Each of your highlighted items will be shown randomly on the home page rolling showcase and in the relevant search results with other sellers’ highlighted items. Plus we will plug your highlighted items weekly across our popular social pages to 10,000+ genuine followers. Banner - promote your Online Stall with your own banner that will be displayed in the right hand banner column of the web pages customers view when browsing for items and stalls, including the home page. When your banner is clicked-on it opens your Online Stall. You can easily upload and change your banner at any time. The display of your banner and position in the column will be rotated randomly with other sellers’ banners. Special offers - promote your Online Stall with a special offers’ advert (up to 100 words) placed in front of your listed items with a promotional image (optional), and include your advert in the special offers section of Vintassion “Uncovered”, which is also linked to from our that is emailed weekly to all customers on our mailing list. So whenever your special offers advert is clicked-on in Uncovered it opens your Online Stall. You can easily upload and change your special offers’ advert at any time. Please note your advert display and position in the special offers section of Vintassion "Uncovered", will be shown randomly with other sellers’ adverts. Plus we will also promote and feature your special offers from time to time in the weekly Vintassion Uncovered Newsletter and across our social pages to 10,000+ genuine followers. Expanded Seller Profile - promote your listings with an expanded entry in the A-Z of Stall Holders' directory by including a 50 word Seller Profile of your Unique Selling Points (USP) and a logo/ image, and when your entry is clicked-on it opens your Online Stall with your 50 word USP and logo/ image in front of all your listed items. You can easily upload and change your 50 word USP entry and logo/ image at any time. The standard Seller Profile directory entry is your seller’s name, town and county location (or country if an overseas based Seller), customer reviews, my fairs, payment options, policies, number of sold items, and number of recently sold items; all of which are also included in the Expanded Seller Profile directory entry. Plus we will also use your Expanded Seller Profile and logo to further help introduce, promote and feature your Vintassion Stall from time to time in the weekly Vintassion Uncovered Newsletter and across our social pages to 10,000+ genuine followers. Sellers' web links - further promote and sell your own vintage, retro, upcycled & handcrafted including up to 3 web links in the top part of your Online Stall to other sites or pages where you promote and sell your items e.g. ASOS, Etsy, eBay, Depop, Facebook or your own website. Your web links will be introduced as follows: “Please also visit our other web pages:”. When a web link is clicked-on it opens as another web page in the browser. You have the flexibility to easily add, change and delete your web links at any time. Plus we will include your web links alongside your Expanded Seller Profile when we feature your Vintassion Stall from time to time in the weekly Vintassion Uncovered Newsletter and across our social pages to 10,000+ genuine followers. Running any of these supporting promotions during a selling period is entirely optional and each one only costs £1 for a 30 days selling period, or £5 for a 365 days selling period. You may select any of these promotions whenever you renew your selling period. Seller registration in no way commits you to pay any on-going renewal of your selling period or any other fees. So you may decide to take a break after the end of any selling period and re-open your Online Stall whenever best suits by simply renewing your selling period by logging back in to your seller’s dashboard. To help make re-opening your Online Stall easy you can activate or amend old listings as well as placing new listings using your seller's dashboard. Please take a look at our Sellers' Frequently Asked Questions page and don't hesitate to get in touch should you have any queries by email: enquiries@vintassion.com or call mobile 07928 809624.